It was over a decade ago, but I vividly recall that I had to sit down when I got the call from my publicist at Harvest House Publishers. The media attention for my newest book—the 24th in my writing career—was unlike anything I had ever experienced. It seemed I had struck a chord in Setting Boundaries with Your Adult Children wherein I shared my perspective as a parent in pain who had managed—with God’s help—to develop a tough-love approach to parenting. An approach that set me free from the dysfunctional relationship I had built with my frequently incarcerated and heroin-addicted adult son. It was a freedom from enabling that not only helped me—but ultimately my son as well. It had been a long journey—one that started at the age of 35 when I finally reached the end of my rope and accepted that God is in control—not me. Back then, as a newly-minted Christian, I struggled to fit in with my predominantly secular friends. I had so many questions about my fresh faith, but there were few people in my circle I could approach for answers. That’s when I discovered Christian talk radio. I never knew such a thing existed. Fortunately, the pastor that led me to the Lord did. In fact, he not only introduced me to this venue, but also to classic and contemporary authors and singers whose work dominated the “religious” landscape. Like a hungry baby, I found nourishment in praise and worship music, and I devoured books—amazing books like; In His Steps by Charles Sheldon, The Pilgrim’s Progress by John Bunyon, The Screwtape Letters by C.S. Lewis and especially the 1983 edition of Love Must Be Tough by Dr. James Dobson. And during the long daily commute from Orange County to Los Angeles, my car became my sanctuary and seminary as I found myself drawn to several radio talk-show programs with hosts whose messages seemed to resonate in my spirit. One such program was Focus on the Family hosted by psychologist and bestselling author Dr. James Dobson. As the single mother of a troubled teenage son, I was desperate for any advice that could help me navigate a journey that was becoming increasingly challenging. I listened to Dr. Dobson’s program daily and soaked up his wisdom and the forthright way he promoted biblical truth and foundational faith-based values. There is no doubt in my mind that God used the teachings of Dr. James Dobson and several other gifted broadcast ministers to open my mind and heart—and help to change my life. I was a baby Christian, completely unfamiliar with what it meant to glorify God through an authentic relationship with His Son, Jesus Christ—but through these broadcast ministries I was learning. Fast forward two decades and 23 published books later, and my career as a Christian inspirational writer was growing. So, too, was the drama, chaos and crisis in the life of my now adult child. 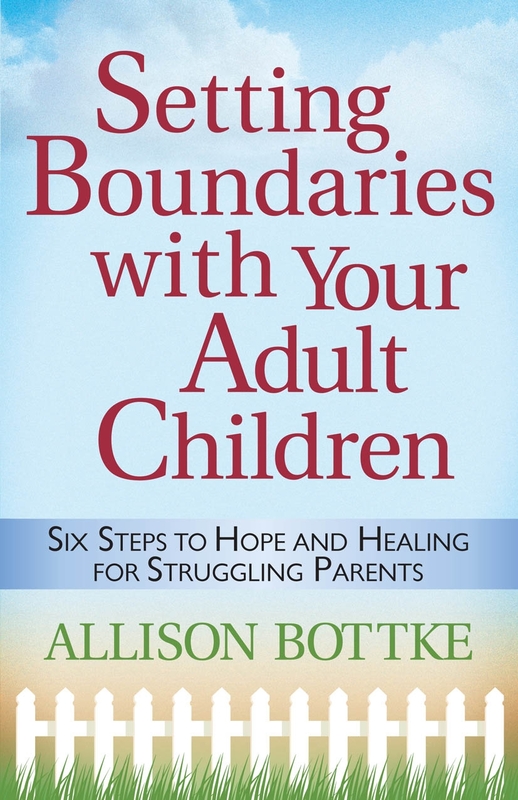 My once troubled teen was now a full-blown heroin addict when I finally realized all my “helping” had really been “handicapping.” As I struggled to find sanity in what had become an insane situation, I wrote Setting Boundaries with Your Adult Children – Six Steps to Hope and Healing for Struggling Parents. It released in 2008 to critical acclaim, and a new ministry outreach based on setting healthy boundaries was born. There are now seven books in that series from Harvest House Publishers. Did I want to go? Seriously? Of course I wanted to go! That 2009 interview with Dr. James Dobson not only changed the trajectory of my writing career, but it cemented the realization I had on the miraculous ways God works in our lives. We can never doubt—no matter how difficult the journey—that God is in control, and His plans are far bigger than ours can ever be! When I found myself sitting across from the man who God used to pour so much salt and light into my life, I was overcome with emotion. Emotion that carried over from our private meeting in his office to our conversation in the broadcast studio. In fact, if you listen to our interview, you’ll hear Dr. Dobson comment on my tears and on the mascara running down my cheeks! That landmark interview turned into a two-part series that has consistently ranked in the Top Ten “Best of Broadcast Collections” featured on Dr. James Dobson’s Family Talk program. Clearly, the issue of setting healthy boundaries with our adult children continues to be a topic of concern for many parents. Tenth Anniversary airing of that acclaimed two-part interview. All that said, I’ve been working on the next SANITY SUPPORT email newsletter, but when this breaking news came in from Family Talk, I put that on hold to deliver this invitation announcement to you. Please tune in to the two-part interview and share the links with friends and family who need to find SANITY in their lives! And join us in our private Facebook Group for folks who want to learn how to set healthy boundaries and find SANITY! Click on this link to join our Members Only private group. Thank you for your support and prayers. I wouldn’t be here without you. Dr. James Dobson’s cultural influence continues across 40 years in broadcasting, advising five U.S. Presidents and authoring more than 30 books.